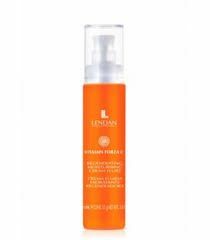 A facial fluid formula based on orange concentrate and enriched with orange peel essential oil that provide the skin with regenerating and repairing properties. -Anti-free radical action thanks to the combination of Orange Concentrate, vitamin C, vitamin E and orange peel essential oil. -Moisturizing action, thanks to Provitamin B5 and AHA fatty esters, boosted by active ceramides that enhance the skin’s water retention capacity.